On a summer day at OKC-Selecman, young children gathered around an adult volunteer in one room as she read from a book about the fish that starred in the animated movie "Finding Nemo." Meanwhile in the sanctuary, adolescents took turns practicing reading aloud in front of a tutor. Reading, food, and skits based on the miracles of Jesus highlighted Selecman UMC’s inaugural Summer Fun Reading Program that ran from June 14 to July 7. The idea for the mission project, which also involved students from nearby Roosevelt School, came from on high, said Ernest Jackson, pastor of the church. "I talked to the Lord. He wanted us to have a relationship with the school," Rev. Jackson said. Summer Fun drew 21 children, ages 4-14, from the church, the school, and the neighborhood. Jackson hopes Summer Fun will become an annual event at Selecman UMC. Weekly worship averages 31 people. 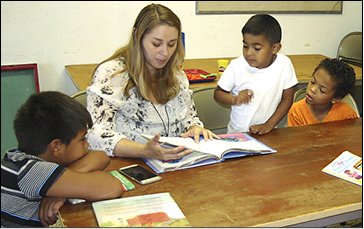 Goal of the program was to improve the children’s reading skills in both English and Spanish. A typical day at Summer Fun also featured arts and crafts and lunch. A table in the fellowship hall displayed butterfly and animal figures and necklaces made by the children. The children especially enjoyed putting on a daily skit, Jackson said. He gave them choices from a list of several miracles by Jesus. One day the children decided to perform a skit on the raising of Jairus’ daughter. That miracle appears in Mark 5:21-43; Matthew 9:18-26, and Luke 8:40-56. The story varies between the Gospels. Jairus had gone to Jesus and asked him to heal his daughter. Mark and Luke report the girl was dying; Matthew states she was dead before Jesus revived her. In each skit, the children portrayed the characters involved in the miracle. Both girls and boys vied to play the part of Jesus, Jackson said. They had to imagine what the people in that era looked like, as no costumes were used. 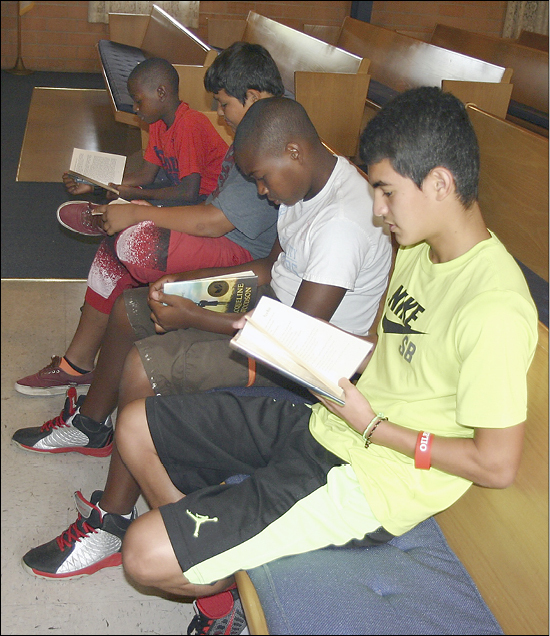 Boys practice their reading skills during OKC-Selecman’s Summer Fun Reading Program. From left are Brayan Diaz, Robert Taylor, Isaac Chavira, and Asaiah Givens-Day. Below, youngsters listen to a story read aloud by volunteer Rachel Hull. From left, they are Ezekiel Grant, Estaban Diaz, and Shakureyeon Givens.